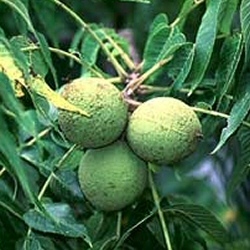 The Black Walnut (Juglans nigra) hails from the eastern regions of North America. Relatively rare in Britain, it is an extremely impressive fast-growing tree. This is a large tree with a broadly pyramid-type form, and given that its final height is 20m (66ft 8in), it is a tree well-suited to a large garden. Black Walnut produces a good crop of walnuts in a season. Also of note is the pleasant aroma of the crushed foliage. This tree is supplied at a height of between 1.5 and 2.0 metres in a 7-12 litre container for year round planting and better results than from bare-root or rootballed stock. If you are looking for more than one tree e.g. setting up an orchard then take a peek at WHOLESALE WALNUT TREES where you will receive large discounts for bulk purchases.